The Full Text RSS Feeds add-on works only in conjunction with the Feed to Post add-on. Feed to Post must be activated on your site, as you won’t be able to activate Full Text RSS Feeds without the add-on. Once both plugins have been installed and activated and the appropriate License Keys activated, you will be able to use Force Full Content to bring in the full article for Feeds that only provide partial content. For more information regarding full text feed imports you can refer to this page and these FAQs. The full text algorithm works by going to each individual feed item’s source page and reading that page in order to determine the actual full content of the item, and some other data about it, such as the featured image. The software behind this service does not see what humans see, but instead it sees HTML markup, and from it’s structure attempts to determine what is what. However, in some cases it is not possible due to wrong page markup and lack of semantic connection between elements of the page that identify it as an “article”. You can read more about how the Full Text service works here. 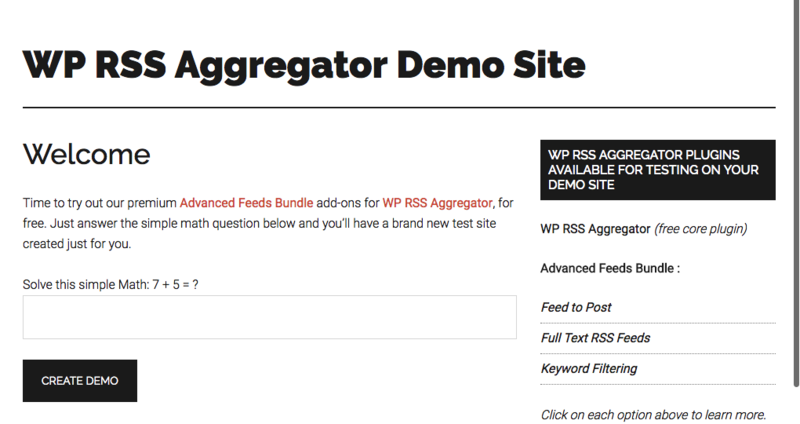 To check whether your feed sources are set up correctly to import the full content using this add-on you can use our free Full Text RSS Feeds Demo. Simply enter the feed source URL, choose the settings you need, and hit “Create Feed”. This will generate an example full text feed for that source where you can check what content is able to be imported using our Full Text script. This will generate an example full text feed for that source where you can check what content is able to be imported using our Full Text script.